“Made in Punjab”- The BEST Lunch Ever!! Ohhh… Did I repeat the same thing, albeit in different words? No No.. Please don’t blame me; I am just back from the BEST LUNCH of my Life. Yes, BEST LUNCH speaks miles. 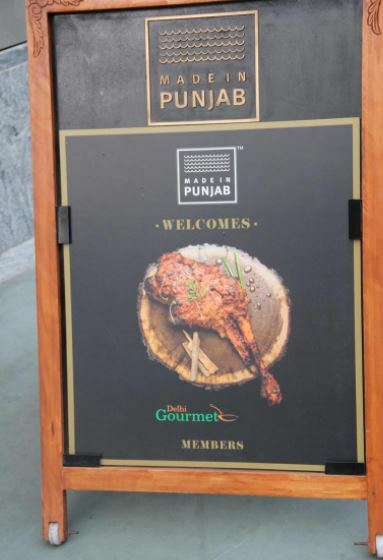 It was a Wonderful event organized by “Delhi Gourmet Club” (DGC) at the “Made in Punjab” Restaurant recently opened at the Cyber Hub in Gurgaon. Have been following and loving the Club, But waited in the wings for very long. Every time thinking that next time I shall take a plunge. It didn’t take me long to decide to be part of the event once Rocky Mohan Sir informed me that Mr Jiggs Kalra would be personally be there at the event. And I am thanking myself for the Plunge. On a wonderful Typical Winter Delhi Afternoon, we headed to Gurgaon and reached the CYBER HUB, to be greeted by the Amazing members from the DGC. The Excitement was in the air… The smile was there on everyone’s Lips and my sixth sense could tell me that we are here in for a wonderful afternoon. It was only later to be realized that it would extend till evening too! After greeting everyone and seeking blessings from the great Chef and celebrated Food Writer Jiggs Kalra, we headed to start the afternoon with the Super Amazing Finger Snacks and a few glasses of Jacob Creek Chardonnay Wine. Another highlight was the PrawnBlachao, which was served on a Cracker. After teasing us for a while with the finger foods, came the moment for the real fare. Once On our Tables, we were well taken care of by the Staff at “Made in Punjab” and they asked us about our Food Preferences. And no, I don’t only mean if we are Veg. or Non Veg. but also, if we are allergic to any special food etc etc. Such Care sets the ground for us on what kind of Hospitality to expect and even our raised expectations were met brilliantly. We were glad that we had a Vegetarian Sid Aryan on our table. Because that meant we could taste and then eat his food too. The first to be presented was Amuse Bouche which was an Amazing Palak Patta Chaat. The Chaat was delicious and we were really tempted to ask for more. But resisted, as it gave us a glimpse of what more could be in store. And then we were presented Tomato Soup which had Tawa Asparagus along with Toasted Kalonji Seeds. Have to mention that “The Hat Plate” added to the experience. So we were presented with a Tandoori Mutto Chaap (Triple) and have to say, it was just perfect. Most of the restaurants either serve it too hard, that the Flesh does not leave the Bone easily, or some over cook a lot and in the process, the mutton is so soft that it looks like Marmalade and not how Mutton should be. Then we had Salmon Tikka…regards to which we had doubts about and conveyed it to Zorawar Bhai. Oh Sorry, I forgot to introduce him. Back to Salmon, after hearing us out… he explained us on how a Salmon Tikka is Made, How they Import it from Abroad, How a Actual Salmon Tikka should taste like, How the flakes should be. And later ordered another helping for us. Kehna Parega….. After all that knowledge in our heads… the Salmon Tikka tasted Divine. Along with Salmon Tikka came Galouti Kabab and Varqi Parantha which was good and the Kabab left a Lingering taste on my taste buds, long after it was eaten. After The starters we were presented with a Sorbet, which was innovatively presented on a stick like a Kulfi. The purpose of Sorbet was to clean our palatte for the main course. Only problem I faced was that when I see it, It looked like a Kulfi and when with same expectation I Ate, it was not sweet. So somehow 2 senses were competing against each other. Now ready for the Main Course, we were presented with a Slow Cooked Lamb Shank dressed with Keema Gavy. And by this time I had shunned by Chhuri Kanta and started to dig in… And it was not food, It was “An Edible Piece of Art” Meat so Succulent, Texture so smooth and Taste so Flavorsome. Whenever I go back and that would be soon, I would order the Lamb Shank for sure. Then we had the Ajwaini Prawans, which had a Piquant taste and somehow not what my taste buds enjoy. The Butter Chicken along with Dal Makhni is one combination that any Punjabi can die for And I Announce that I am willing to die twice if this combination comes from “Made in Punjab” Kitchens. With our Tummy’s holding more than it can hold, We waited for the Desserts. A Wonderful plate carrying a Combination of Rasmalai and Gajar Halva topped with “Sone ki Varq” was presented and was polished off in a matter of seconds. Another Dessert we relished was the Chocolate filled Gulab Jamuns beautifully presented on a bed of Roasted Fig and topped with Sesame Chikki as a Flag. And then came the moment we all waited for…….. Crispy saffron glazed Jalebi’s along with Lacche Daar, Daane daar Rabri. See the pic below and drool. And if you want to drool more, then see the image below that. After having 2 servings of Jalebi, we requested the server to do some utla pulta and requested him to put the Jalebi’s in the glass first and then pour the daanedaar rabri over it. And the Experience is too big for words…. So just close your eyes and feel the combination of Rabri Covered jalebi’s flirting with your tongue. So, as I Said in the beginning, that it was not only my BEST LUNCH ever, But also the Longest one and I still wish that it would have lasted a bit longer. After reading the entire article, I have realized that my words have not done justice to the Entire Experience. So, would let you go yourself and check out the fare and thank me later. 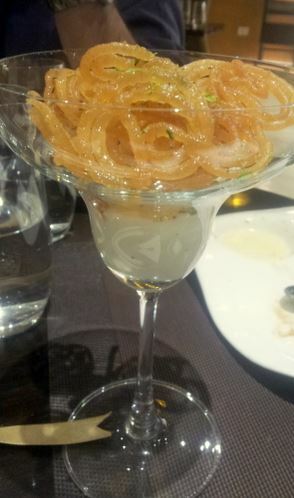 And yes, when you send me the Thanks message, Do remember to send a glass of Jalebi Rabri Along with!! Special Thanks for everyone at “Made In Punjab” and at “Delhi Gourmet Club” for this amazing experience. “Na Kar Bura, Na Ho Bura”---Yash Chopra on The Gift of Lessons, My Gifting Company Taught Me. Look Around and Everybody is an Entrepreneur-Dahi Bhalle Wala bhi - Gurpreet Singh Tikku on Look Around and Everybody is an Entrepreneur!! Rajan Balana on Can India be Next Singapore or Better after the “Swachh Bharat Abhiyan”? Gurpreet Singh Tikku on Can India be Next Singapore or Better after the “Swachh Bharat Abhiyan”? Rajiv Ahuja on Can India be Next Singapore or Better after the “Swachh Bharat Abhiyan”? Har Chehra BAHUT kuch kehta hai!